These rocks live on the coast of Peru and Chile. Two siphons connect the organisms to the surrounding ocean, where one is used to exhale and the other to inhale. They feed on sea water by inhaling and filtering out all edible microalgae by use of a moving layer of mucus found in its enlarged pharynx. The other siphon is then used to exhale the water out. The Pharynx acts as the organism’s mouth and is connected to its digestive tract. The Pyura chilensis contains clear blood and high quantities of vanadium, a rare and mysterious element. The vanadium is 10 million times more in the creature than in sea water. How they are able to accumulate high quantities of vanadium and what part it plays in the creature’s development is not yet known. These rocks belong to the Ascidiacea non-moving class of sac-like invertebrate marine filter feeders, known in other words as sea squirts. Since they cannot move around in search of mates, the Pyura chilensis are hermaphroditic. They are born male but over time grow female organs. Breeding involves the unique and fascinating release of both sperms and eggs into a fertile cloud, where they meet to form off springs that are tiny and tadpole-like. These eventually settle on rocks nearby and grow into adult form. The Pyura chilensis belongs to the Tunicata Subphylum class due to the thick “Tunics” made of Tunicin that cover it. These help them blend into the surroundings. The Tunicin is a hard matrix of molecules that assist the creatures attach themselves on to hard surfaces. An epidermis and muscular band lines the insides of the tunics. Seeing one of these creatures sliced in half is the most bizarre thing ever because inside these Tunics is a tissue like mass that is bright red and that will leave you flabbergasted. The raw insides of this alien-like organism are a delicacy and are used as ingredients for stews or eaten in their raw form. 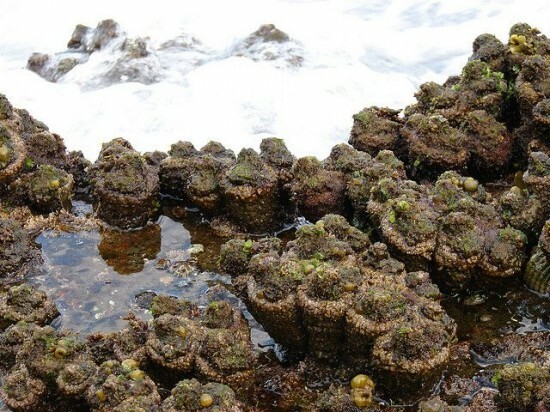 Locals describe them as having a “bitter” and “soapy” taste that has a “weird iodine flavor”. For many years, the Chilean and Peruvian locals have been fishing the Pyura chilensis for commercial use.